Merci, Destination Canada! 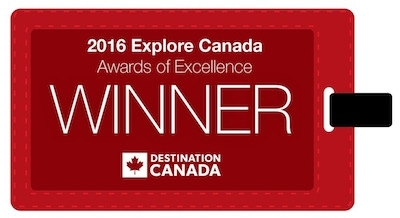 My report on Montreal's circus scene won their award of excellence for festival coverage this year. It's out! 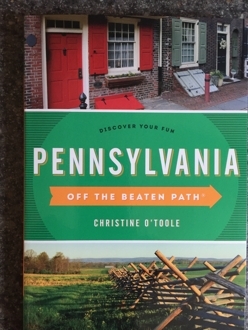 My latest update of Pennsylvania Off the Beaten Path (Globe Pequot) makes an even dozen editions of this funky little guidebook. Another Quill to pin to the wall--this, for my story on The Fred Rogers Company. Thanks for the assignment, Pittsburgh Magazine. With a new camera and a new country, I went a little overboard. Twelve hundred photos later of Hanoi and Myanmar later, I've posted a few to the right. Back from Croatia to find two (more) Golden Quill awards for stories I did in 2013. Thank you, Western Pennsylvania Press Club. I love my NG Traveler editors for using the headline I suggested on my piece in the April-May print issue. Me, Tony Hawk and Alec Baldwin--in the latest NGS wish book, with my essays on Morocco, Cornwall, Jackson, Bordeaux and Prague. All year-round faves. Revving up the motorbike: The new NatGeo guidebook includes a few of my essays. Two steps forward, one step back: that hopeful announcement in my Pittsburgh Magazine story on Braddock? Scratch that. After approving a creative idea to move its offices to downtown Braddock, the Woodland Hills school board reneged, just as the mag went to press. Back to the drawing board. Answers to all your questions (or questions to all your answers) on my Jeopardy! gig, in the Spring issue of Pittsburgh Quarterly. Thanks to all the old friends who watched me on Jeopardy! last week. I know eight million people watch the show, but didn't realize that I would actually know any of them. 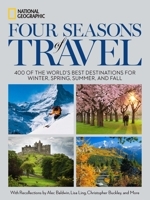 What everyone on my gift list is getting this year: National Geographic's World's Best Travel Experiences. I'm a contributor. The photography's up to NGS' spectacular standards. Heavy enough to double as a great doorstop or blunt weapon, too. Those Romans were everywhere, including Morocco. 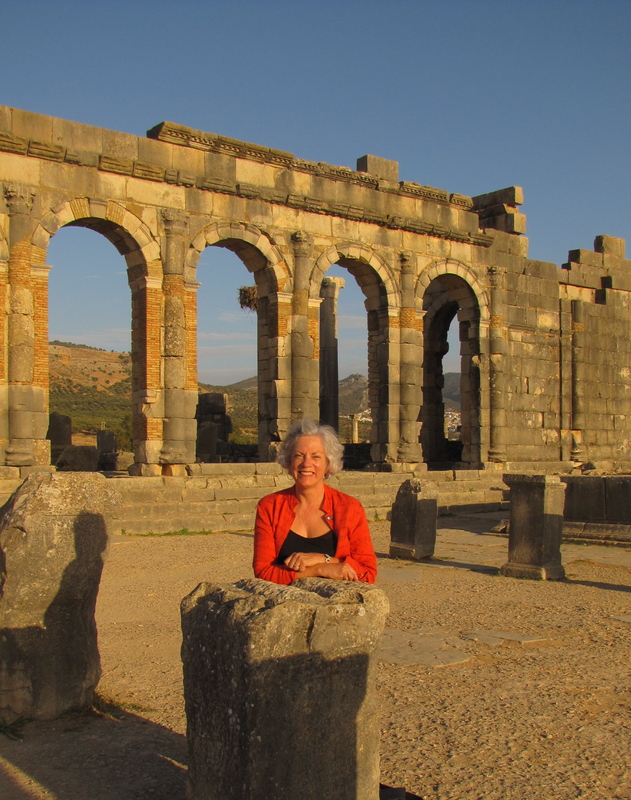 I visited Volubilis, near Meknes, last week. A new view of an old town: here's us on the top of London's O2. Stories evolve and occasionally get published in strange ways. It was my friend Reg Henry, avid cricketeer, who introduced me to one of the new Americans I featured in my front-page Post-Gazette stories today--via Pittsburgh Today and Pittsburgh Quarterly, which originally green-lighted the project. 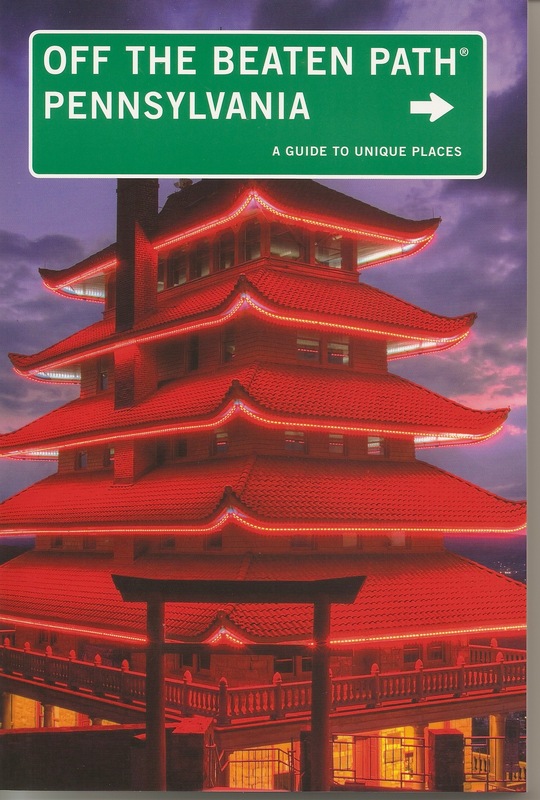 Nothing says PA like a pagoda. (This one's the famous landmark in Reading.) In other travel news, this morning's USA Today story on "51 Best Beaches"includes my recommendation--but you'll have to pay for the print edition to read it. 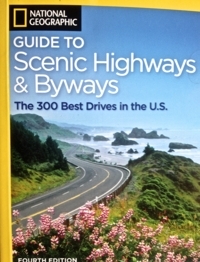 I met fellow travel writers Jen Miller and Mara Gorman by phone on Friday when we opined about summer destinations on WHYY Radio. Note to self: Island Beach State Park in New Jersey sounds cool. National Geographic's Intelligent Travel blog asked me to contribute some answers to an I Heart My City on the 'Burgh. I forgot to post it till now. Discuss amongst yourselves. Just back from New York, with yet another transit of the Pa. Turnpike complete. My husband is once again calling me Ms. Pennsylvania. In April I share my wealth of Commonwealth tips in my cover story in Pittsburgh Magazine and the most recent edition of my guidebook, Pennsylvania: Off the Beaten Path. Another piece from the Southeast Asia sojourn in Hemispheres, too (but you'll need plenty of Zen to read it online). Ah--OOO-gah! My submarine story surfaces in the current issue of Carnegie Magazine. Ten years of storytelling for h. I'm proud to have contributed 11 cover stories to the Heinz Endowments quarterly, recognized three times over as the country's best large foundation magazine. See my latest feature,United Front, in the current issue. 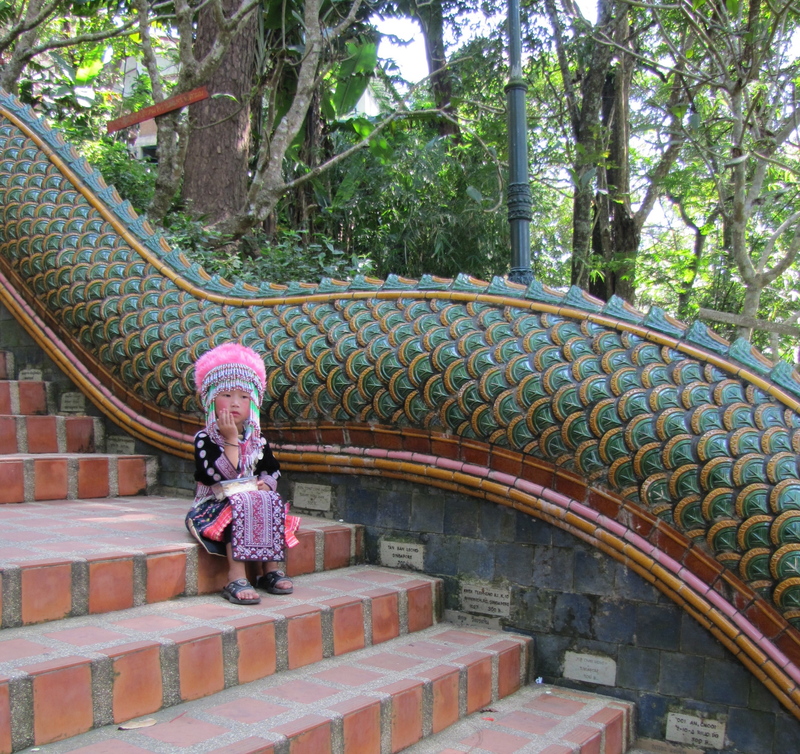 My Washington Post story on Chiang Rai today also includes two of my favorite photos from the trip. WaPo in my tail lights: Pittsburgh replaces Portland on the 2012 In and Out List. I've gotten to know a few more great little towns in West Virginia as I continue to write about the work of the Benedum Foundation. In the past I've reported on R&D, the local food economy, and the amazing life of Mike Benedum, one of the world's great oil wildcatters. This year's annual report is just out, with my story about grass-roots community development. As usual, Vicki Crowley at Landesberg Design created a beautiful frame for the words. Check out Rebecca Kiger's photography in Ansted, Shinnston, Chester and Morgantown here. 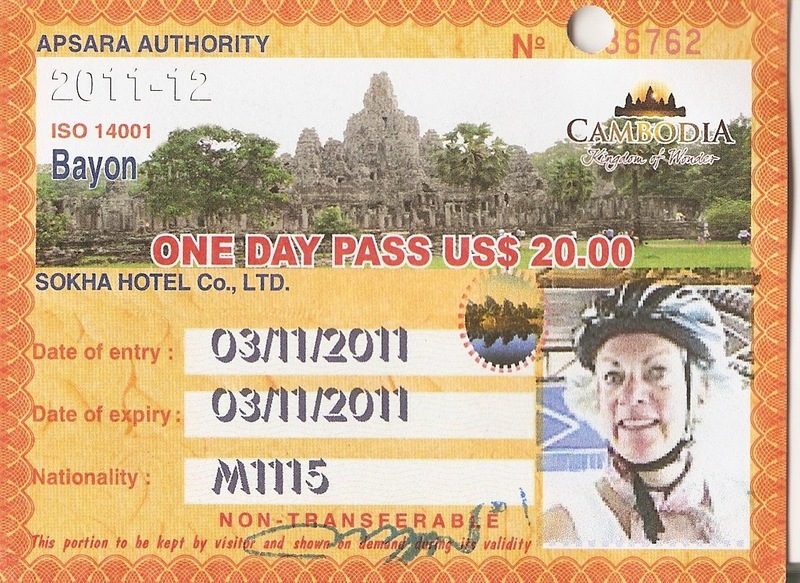 This pass to Angkor Wat Archeological Park set me back 80,000 riels. No wonder the Cambodians prefer US dollars. We biked to three of the temple sites, all unique and mossy and magnificent, and heading back to Siem Reap, encountered traffic mayhem that made Chiang Rai look like a lesson from driver's ed. That night we swam under a half moon. Now I'm looking at it from Pittsburgh. Chiang Rai: maybe "inland Maui" is the best way to describe it. Green mountains surrounding a valley, mist, rainbows and plenty of hot sun. 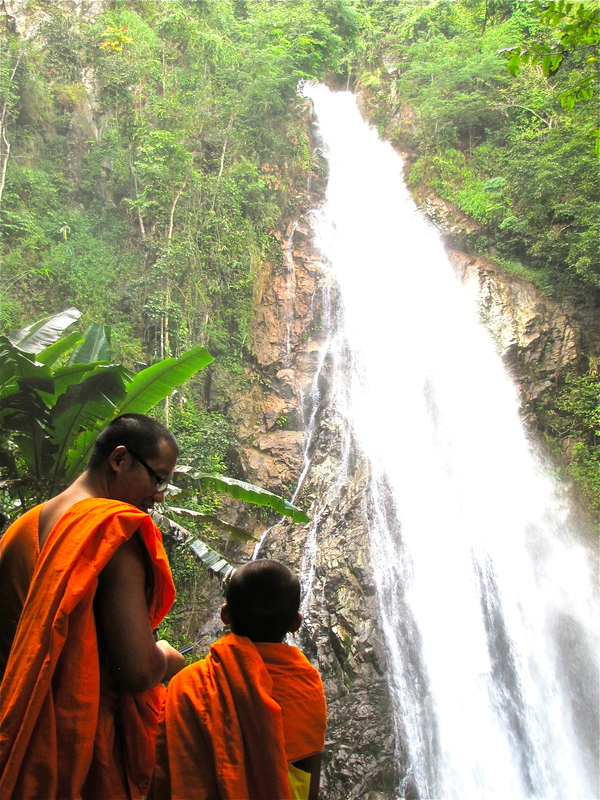 Yesterday we hiked to the Khun Korn waterfall and met some new friends. Heading towards the Mekong and our heart of lightness: reunion with son Bill in Chiang Rai. The easy and cheap way to go north: a three-hour ride on the VIP Green bus, with A/C and Thai sitcoms on the flat screen. And cheap! We roll up through mist and mountains, emerging in a broad valley full of plantations: rice, coffee, palm. Cars? Hardly any. Motorbikes are the way to go here: we join the college kids zipping along Route 1 on our own steed. Dangerous? Sure. Fun? Most def. Onward to Chiang Mai; the floods in Bangkok convinced us to change plans, and when we touched down briefly at Suvarnabhumi, there was water everywhere. The north flooded a month ago, and the Ping River was back to a muddy meander through CM. Great night market, super mountaintop temple (Wat Phranthat Doi Suthep, with performances by young local dancers), and wily songtaw drivers who drive a hard bargain (laughing all the way). 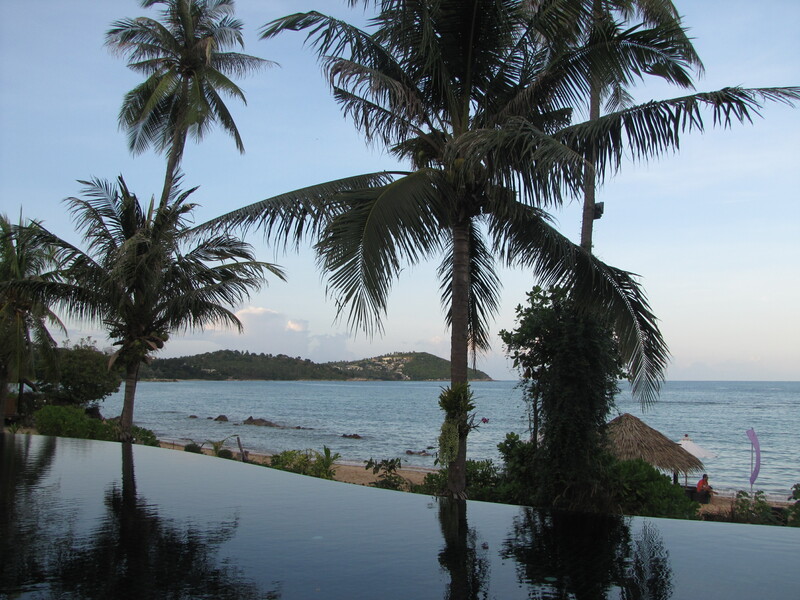 Koh Samui: pick your beach in advance. Changwei, to the northeast, has a pristine beach that gains shade as the sun moves from east to west. Bophut, the old north end hippie beach, has the hawkers, the beach massage ladies, and salty surf that rivals the Dead Sea (where does that extra saline come from, anyhow?). We liked Lawanna Changwei (two words: plunge pool). But I give bigger props to the Koh Samui emergency medical care system (in short, my nose broke my fall). Look for my forthcoming tribute to Thai medical tourism. For a few hours in the middle of the night at the oh-so-lovely Queen Hotel in Surat Thani, we doubted that the overland/ferry route to Koh Samui was worth it. In fact, it was: your garden variety South Pacific paradise. Now the question that looms: will we be able to get to Bangkok as it floods, or will we have to stay here indefinitely? The journey of a thousand miles (up the Malay Peninsula) has begun with serious sweat and a few missteps. Supermodern Singapore was a perfect entry point, hyper-efficient, hip and friendly. Most people on the MRT clutched both iPads and iPhones for their commutes. Malaysia began when we boarded the train north: seven hours to Kuala Lumpur in icy refrigerated coach seats; after we thawed at the KL station, our overnight journey to Penang, billed as "first class sleeper," was just as cold. We stumbled onto the Georgetown ferry at Penang this morning, but face a further dilemma: do we really want to arrive by train in Surat Thani at 1 a.m. to catch a ferry to Koh Samui, our Tuesday destination? Ouch. Innoculated and ready for Southeast Asia. © 2011 Christine H. O’Toole. All rights reserved.